The 4-LED Performance Running Cap is a great new tool for your early morning or evening training! No more inconvenient and bulky headlamps. Exclusive patented C.U.B. 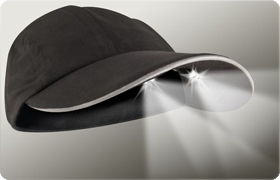 (Concealed Under Brim) Technology™ allows you to light area in front of your feet with 2 LED's built UNDER- the-brim and lighting the distance ahead of you with 2 Ultra Bright LED also built UNDER-the-brim. Lightweight training cap made entirely of the highest quality moisture wicking materials available. High performance mesh, and high performance moisture wicking weave sweatband. Stylish two tone mesh on unstructured * twill design. * Unstructured = Top portion of all our caps are made with six panels of material. The front two panels are more floppy/flat. Structured = The front two panels will have a batting material to make the front panels more stiff or more structured.